You can access your subscription invoices at any time from the Subscriptions menu. Each line presents information from your invoices (customer, frequency ...). Right click (or the button to the right of the line) to access more options. You can directly access the schedule, as well as edit or delete the subscription. The schedule also shows the invoices already issued and detailed total (estimated total, total generated and forecast). Other tabs shows a summary and let you add comments for your team. 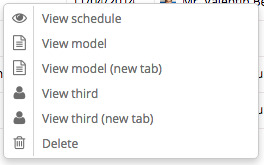 You can also access your recurring bills from the original template by clicking Subscriptions listing. How to adjust your subscription rates?